1/144 High detailed Army 30 multipose figures, destined to handle cargo from trucks to planes or reverse. Half of them are in M1943 late war uniforms with lace boots and M1 helmets, and the rest wear long trousers, sleeved up shirts and bare heads. 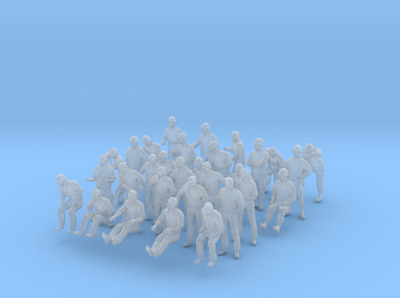 Some sit figures and sit drivers are included too. 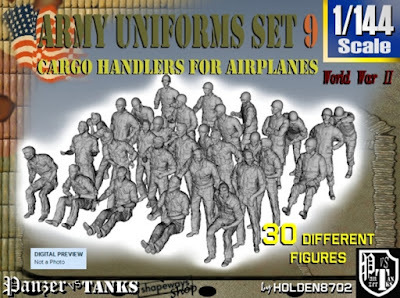 ALL THESE FIGURES ARE ALREADY IN MY "Army Modern Uniforms Set 3" and "USN Dungaree Set 11", NO NEW FIGURES INCLUDED IN THIS SET. These uniforms have a look very close to modern US Army, US Navy, USAF and US Marine Corps, but also to many modern uniforms used in several countries. M1 Helmets are modelled representing bare metal as in World War II; thus these are good for Navy units or 1945 to 1960 Army units, after that date, Army units were using cloth covers on helmets. Otherwise, bare metal M1 helmets were also in use in several armies for years too. Then this set can be used to recreate crews from armies for many countries, ships, aircraft or army bases. Figures about 12 mm. - 0.49 inches tall when stands up.